When renovating your kitchen, one of the biggest concerns will be the cost of the project. Average kitchen renovations call for varied and costly materials from counters to cabinets and flooring, depending on your project. 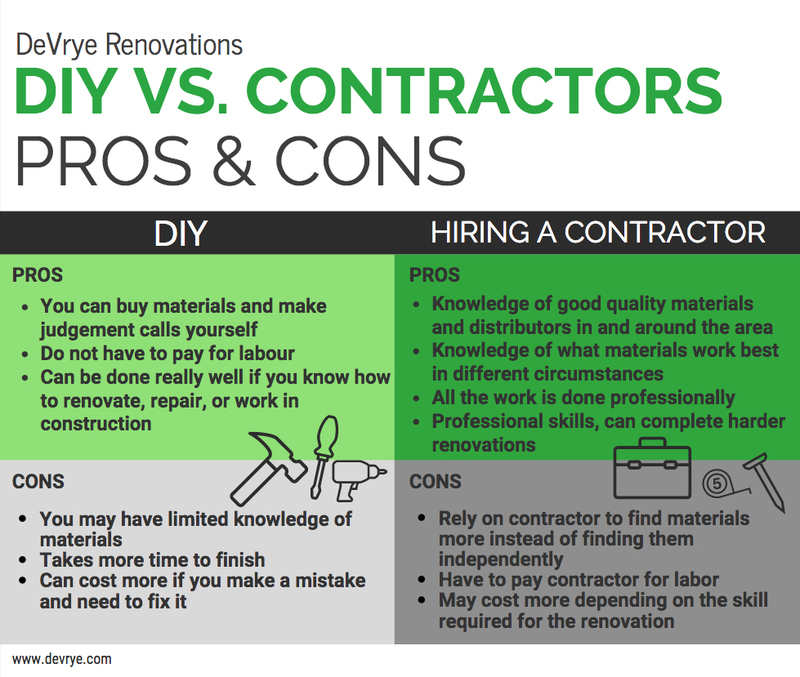 In order to best understand and plan your renovation expenses, DeVrye Renovations has put together a quick overview of how to budget and how to allocate your money for your renovation. 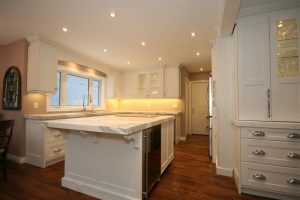 DeVrye Renovations is located in Kitchener-Waterloo and we have had the pleasure of renovating over 1,000 homes in the area over the past 20 years. Our team of professional craftsmen approach each task with care and precision to ensure great results with minimal inconvenience along the way. If you would like to get started on a renovation project or learn more about us, do not hesitate to contact us! The success of your kitchen renovation will be highly dependent on good budgeting. Before you decide on anything else, confirm how much you will be willing and able to spend on your kitchen. While some people like to do a renovation in stages so they can start right away and can pay for one thing at a time, it is highly recommended that you save up money to complete your renovation. Saving money increases the likelihood of a good renovation and will result in a better quality project done in one go. It also gives a bit of room for unforeseen expenses or emergency situations. As soon as you decide to renovate, make sure that you are saving enough money for the project. You can open a savings account to keep you on track. Along with bank accounts comes the idea of a mortgage. While the lines are blurry around the benefits of using a mortgage for your renovation, it is usually recommended to be prepared with an appropriate amount for your renovation regardless. Click here to see what we have to say about mortgages. At DeVrye Renovations, we decided to work with TD for their excellent customer service. Similarly, we strive to provide you with customer service that will really make a difference in your kitchen renovation project. Without a doubt, a renovation will cost quite a bit. You can adapt this breakdown for your budget to figure out how much of a renovation is realistic. If you find that you are lacking your desired budget or find a bigger project you would like to tackle, make sure you have enough money to properly devote the time and energy into that project. For example, if you would like to renovate your whole kitchen but are particularly concerned with replacing the flooring, focus on what will work best to accommodate that need. That being said, it is not wise to cop out on a renovation once you have started. Doing a full quality renovation will ensure that you do not have to spend extra money fixing issues later, and will also boost your home’s resale value. One of the more surprising aspects of renovating is how much it will cost you to live in your home while doing your renovation. In a kitchen renovation, there will be a period where you will not have access to your oven, stove, dishwasher, sink, and other utilities that keep your household functioning. In such cases you may choose to eat out or buy ready made meals more often. Make sure to factor this into your costs. You may also decide to live elsewhere while your renovation is being completed. You could stay with relatives or friends, or move to an apartment or a hotel. If you have access to a furnished basement, you may want to take advantage of the space and stay down there, but that will be of little help if the basement does not have a sink or other ways of preparing food. As always, make sure to communicate with your contractor so you know what will be happening when and can plan your meals accordingly. Check out our article on How To Survive Your Home Renovation for an in-depth look at how to adapt to a new environment during the renovation. No matter how much money you have devoted to your renovation, there are always ways to diminish the costs. Try looking at alternative surfaces or fixtures such as lighting, countertops or flooring. In certain cases, having a cheaper material can be better for wear and tear in your kitchen. Vinyl and laminate are always popular choices and can give the effect of any type of flooring from wood to marble or stone. When possible, keep older pieces in your kitchen. You may want to get entirely new cabinets but maybe all they need is a new coat of paint. Also consider doing some of the work yourself. If you need to demolish something or install something and you are experienced and comfortable enough to do it, then skip paying for someone else to do it. While doing some aspects of the renovation yourself can be fun and worthwhile, it is only advisable if you are comfortable with the work or have done renovations in the past. Doing a renovation DIY without experience can result in more expenses wasted on fixing problems you may encounter while renovating. If you decide to renovate DIY you may be left with an unsatisfactory result. Overall, hiring a contractor is highly recommended not only for their skill, but for their knowledge of materials, where to obtain materials, troubleshooting, and their creativity when confronted with a problem. In many ways, your contractor also acts as a design assistant and can offer you different ways to achieve the look you are going for. They can also custom build pieces for you. 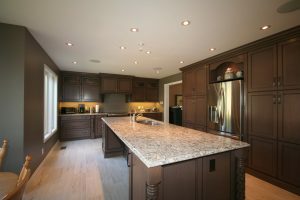 If you live in or around the Kitchener-Waterloo region, we at DeVrye Renovations would love to help you make your kitchen renovation dreams come true! Click here to contact us today! Doing a renovation can take up a lot of time, energy and money. Some are not completely prepared for it and dive right in expecting the renovation to be much like it would be on TV. It is important to remember that a renovation will put your budget, time, and problem-solving to the test whether you are doing a DIY or hiring a contractor. Renovations are not always guaranteed to boost the property value of your home, so if you want a renovation that is truly going to make a difference for you and for future homeowners, research thoroughly and think about what your home needs. Wanting an update is a good start, but figure out what solutions your home needs to get one step closer to boosting the value of your home. Decision making will also be tough. Things will not always fall into place for you. You may need to really stretch to find solutions or materials. Whatever transpires in a renovation, make sure that you are thinking through each decision’s impact on your home. A renovation lasts longer and performs better when done right. While mistakes can be fixed, it is always a good idea to have a clear plan in place so no mistakes can happen in the first place. Openly communicate with your contractor (if you have hired one) to discuss possible solutions or outcomes of different parts of the renovation process. If you communicate effectively, you will be left with an amazing, long-lasting renovation to be proud of. We hope that you found this overview of average kitchen renovation costs helpful and a good first step to planning your kitchen renovation project. Preparation will lead to a better end result, so make sure to think of the things listed above when deciding on how to go about your renovation. Our team of professionals make it a priority to ensure that your kitchen renovation runs smoothly and that you feel comfortable with the process. If you would like to learn more about DeVrye Renovations or if you would like to get started on a kitchen renovation, then do not hesitate to contact us today!